ince we began in 1976, we have operated under the assumption that nothing is possible without responding to the needs of our customers and treating you and others with care and respect. We answer our own phones. We enjoy talking to customers. We like to find out how we’re doing and listen to suggestions. These are not just words; they are our everyday practice. You are our most important asset, and customer care is our number one priority. More of our resources go into creating a positive experience for our customers than any other area of our company. We see customer care as essential to everything we do. Everyone at Applewood Books is committed to helping you. Whether you buy a book or just stop by to look, we appreciate the time you have taken to read these words, because we know that fulfilling your needs and honoring our promises to you will determine our success. You can also easily place your order by phone, email, fax, US mail, or in person. Your Satisfaction is Guaranteed at Applewood! We believe that you should be happy with your purchase. Any book purchased from us at full price may be returned within 90 days for a full refund. Guaranteed. For stores in museums, national and state parks, and gift shops in historic places that purchase books to connect cultural tourists to history and place, Applewood Books provides competitively priced, high-quality, American-manufactured books that help you tell your institutional stories and generate important income for your educational programs. Our extensive, well-priced selection of titles, popularized by time and almost all made in America, will meet your mission and become a cherished keepsake for your customer. We would like to make it as easy as possible for you to sell our books in your resale shop, catalog, or other venue. We enjoy tremendous success with our titles and would like you to be able to do the same. Applewood provides a generous discount schedule and ease in opening new resale accounts or placing new resale orders. Our discount schedule is simple. For a total of 1-999 books on your order, there is a 52 percent discount on a non-returnable basis. For a total of 1,000 books or more on your order, there is a 55 percent discount on a non-returnable basis. For 50 or more assorted in-stock books on any one order, we will pay the freight. 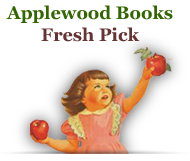 It is easy to set up a new account with Applewood Books. Just call us at 1-800-277-5312 and we'll get you started. If you need help selecting books that will work well for you, give us a call and we'd be glad to make some recommendations. .
Who ever throws away a printed book? More often they are recommended, passed along, displayed, or in times of change, packed and moved along with a person's most cherished possessions. An Applewood book with your name or your organization's name or logo on it is sure to find an honored place on the desk, bookshelf, side table, or coffee table of anyone who receives one. Imagine the longevity of your message stamped in gold on a timeless classic book. Applewood offers imprinting and personalization services for many of the books in our list. Our minimum quantity for imprinting is 100 copies of the same imprint. We create a zinc die from single color art with no halftone and stamp in gold on one side of the book in an area of 1.5" high by 2.5" wide. We do not charge for the die, but we charge $1.50/book. If you are interested in having us imprint books for you, please call us at 800-277-5312. 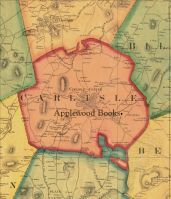 Applewood Books can republish new versions of important books for your museum, historical site, family company, or organization. In our history we have partnered with many customers to prepare previously published books for publication, create new books, or to customize books we have already republished with a customer’s name or other additional content. If you have a project you would like us to help with please call us at 800-277-5312 or send us an email at customercare@awb.com. Applewood books are perfect for corporate gift-giving. Since 1976, Applewood Books has been faithfully reproducing high quality facsimile editions of important corporate, historic, and nostalgia books. Over the last 20 years, many major companies have purchased our titles as premiums or gifts. Companies as diverse as the Walt Disney Studios, Pillsbury, Montgomery Ward, L. L. Bean, the Franklin Funds, and Motorola have found value in reaching back into history to provide their customers with lessons about integrity and a commitment to continuity. We have provided corporations with books from as few as one hundred to as many as 11 million copies. We are gratified by the growth of a loyal customer base; each customer is special to us, and we strive to communicate this by providing excellent customer service and by meeting any individual need. We can also personalize your incentive gift with a custom stamp of your company name and logo on the cover of the books. We value the suggestions of customers. If you have any suggestions for books you'd like us to republish or publish, please email your suggestions to customercare@awb.com.